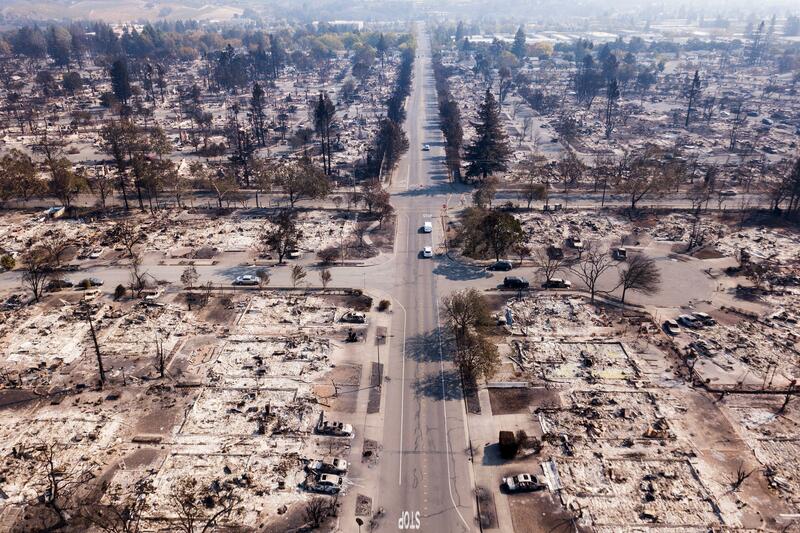 The deadly wildfires ravaging northern California have destroyed more than 3,500 homes and businesses, leveling entire neighborhoods and forcing thousands of residents to flee the flames. At least 31 people have died in the blazes, which have burned 265 square miles of land and rank among the most destructive in California's history. The wildfires kicking off California's fire season come after millions of acres in the western U.S. went up in flames over the summer. Experts say fires like those burning up California wine country will be more frequent, more intense and last longer as global temperatures rise. While no single fire can be said to have been caused by climate change, variations in temperature and precipitation are already affecting the complex dynamics that determine how wildfires develop and spread. California Gov. Jerry Brown laid the blame squarely at the feet of climate change on Wednesday. "With a warming climate, dry weather and reducing moisture, these kinds of catastrophes have happened and will continue to happen and we have to be ready to mitigate, and it's going to cost a lot of money," Brown said. Scientists and fire experts back up that claim. They point to an alarming increase in the severity and frequency of wildfires in the West over the past several years, warning that the problem is only going to get worse. "When we step back and look at the whole West, fires are increasing everywhere at different rates," said LeRoy Westerling, professor of management at the University of California, Merced who studies how climate affects wildfires. "The goose is cooked in someplace like Yellowstone. The frequency of fires is expected to increase so much, and the ecosystem is really going to change." In California, weather patterns over the past several seasons have laid the perfect groundwork for a devastating fire season, which typically peaks in October. As the climate changes, extremes in seasonal conditions are exacerbated, Westerling says. Climate change affects wildfires from two directions at different times of the year: Winters become wetter and shorter, while summers become hotter and last longer. "Climate change is kind of turning up the dial on everything," Westerling said. "Dry periods become more extreme. Wet periods become more extreme." Somewhat counterintuitively, more rain and snow in the winter lays the groundwork for more destructive wildfires. More precipitation in the winter means more vegetation can grow in the spring. Over the summer months, that vegetation dries out and becomes the fuel that feeds wildfires when ignited. Higher temperatures in the summer months mean the trees, brush and grass are significantly drier once fire season rolls around. High-speed Diablo winds from the interior of the continent and increased evaporation due to higher temperatures contribute to drying out the plant life. Higher temperatures also mean fire season lasts longer. California suffered a historic drought last summer, followed by a very wet winter. This dynamic created a tinderbox that was primed to go up in flames, said Susan Jane Brown, an environmental attorney with the Western Environmental Law Center. "We had a wet winter and that provided moisture to vegetation, which grew a lot -- grasses, brush, trees," Brown said. "When you have a lot of vegetation that grows, it then dries out and stays around longer than usual." Brown added that grazing and logging have contributed to the conditions fueling severe wildfires across the West. "We've done a lot of commercial logging that removed old-growth trees that were fire resistant," Brown said. "We've also increased grazing. When you remove low-intensity fuels, what you've got left is a condition on the ground that's more flammable and less resistant to responding well to fire." Warmer temperatures also mean insects like the mountain pine beetle, which attacks and weakens trees, can extend their range further north, leaving more fuel in their wake, according to Climate Nexus. Even under the most optimistic climate projections, the risk of wildfires will remain elevated for decades to come. Westerling warns of dire consequences in the years ahead as global temperatures continue to rise, even if countries cut greenhouse gas emissions. "Say you have an increase of even 2 degrees Celsius," Westerling said, referring to the target limit in the increase in temperature over pre-industrial levels by 2100 set out in the Paris climate accord, which the U.S. abandoned in June. "You would need so much more precipitation to counteract the drying that comes with that. No amount of precipitation in any of the models is enough to counteract the drying." Brown said that increased development in areas now prone to more severe fires means further destruction is almost an inevitability. "People are coming to realize that many of these places have a mind of their own," she said. "When we try to manipulate natural processes to the extent that we have, we're going to see some effects."